Come to Santa Fe for Holidays! Don’t miss the most exciting Flamenco Show of the Holiday Season – “GYPSY BOOK”! . . . under the artistic direction of critically acclaimed guitarist Chuscales Jose Valle! “Chuscales” was the name given to composer and virtuoso flamenco guitarist Jose Valle Fajardo by his gypsy grandfather. Born in Antequera, Spain, Chuscales grew up in a traditional gypsy family of professional flamenco dancers and musicians who lived and performed in the famed gypsy caves of the Sacromonte quarter in Granada, one of the legendary cradles of flamenco. During the nightly shows in his grandmother’s cave, he absorbed the rhythms of flamenco dancing and the nuances of flamenco singing. Throughout his distinguished career, Chuscales has accompanied such Spanish flamenco luminaries as El Farruco, Mario Maya, El Guito, La Singla, La Polaca, La Chunga, Pepa Coral, Juan Ogalla, Soledad Barrio, Carmen Ledesma, Jose Merce, Jose Mendez, Manolo Cano, Serranito and Juan “El Lebrijano.” He has toured with the dance companies of Mario Maya, Jose Greco, Zorongo Flamenco, Carlota Santana, Maria Benitez, Juan Siddi and a world tour as principal guitarist with Soledad Barrios’ Noche Flamenca. He has been a featured performer at the Telluride Jazz Festival, the Santa Fe Jazz & International Music Festival, and the Hollywood Bowl World Music Festival, He has performed with the New Mexico Symphony Orchestra and in his home town of Santa Fe, Chuscales has been principal guitarist and musical director for Maria Benitez Teatro Flamenco and Juan Siddi Flamenco Santa Fe. Most recently he performed at the Tucson Flamenco Festival and in May he will perform at the Houston Flam enco Festival. Because of his profound understanding of flamenco musical traditions, Chuscales has been much in demand as a teacher. 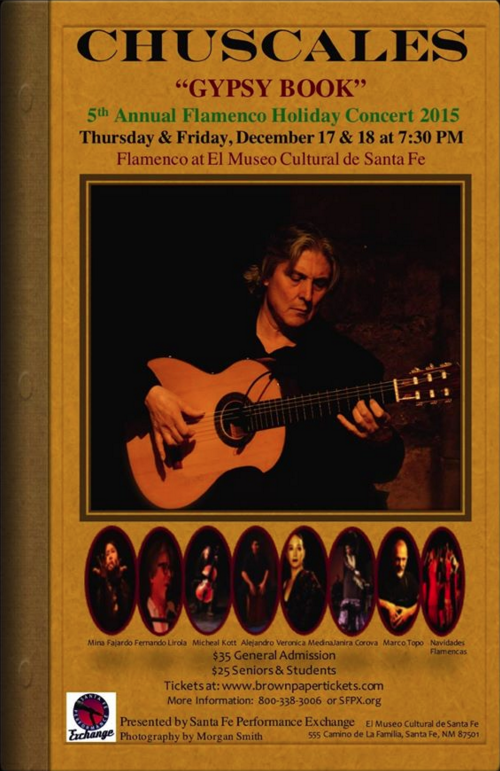 He has taught at Santa Fe Community College, Northern New Mexico College, the National Institute of Flamenco, The Institute for Spanish Arts, Dartmouth University, the University of New Mexico and the Minneapolis and Calgary Guitar Societies. For his musical artistry Chuscales has received numerous award nominations and honors: an Isadora Duncan Dance Award in 1997 for Composition/Arrangement and Direction and a nomination in 2011 in the category of Music/Sound/Text. He was honored with Dora Mavor Moore Award nominations from the Toronto Alliance for the Performing Arts in 2010, 2009 and 2007 for Outstanding Sound Design and Composition. In 2009 Chuscales was chosen to perform for the Crown Prince and Princess of Spain during the Santa Fe 400th Anniversary celebrations. Mina Valle Fajardo, “Mina” has received extensive training in flamenco, Escuela bolero, jazz, Tap and ballet. Mina has received flamenco training from El Guito, Carmera Greco, Ciro, La Tati, La China, Alejandro Granados, Yolanda Heredia, Isabel Bayon, Rafaela Carrasco, Pastora Galvan, Jose Maya, Ursula Lopez, Adela Campallo, Rafael Campallo, Concha Vargas, Eva La Yerbabuena, Farruquito, La Lupi, Andres Marin, Joaquin Ruiz and Keiko Issiki. She has taught in the Maria Benitez Institute for Spanish Arts, Northern New Mexico University, Santa Fe Community College, Eva Encinias Sandoval’s National Institute of Flamenco, Nava Elementary School, Sweeney Elementary School, The New Mexico Academy of International School, Santa Fe High School, Santa Fe Danceworks, Moving Arts Española, Maria Vazquez Flamenco Denver, The Spanish Institute of Dance in Houston, Texas, and Fazil Dance Studio & Japanese Chamber of Commerce in New York City. Fajardo has performed in Japan, New York City, San Francisco, Boston, Denver, Houston, Maryland and Albuquerque and has made several appearances on television in Manhattan, New Mexico, Japan & Spain. In Santa Fe, She has performed at the Santa Fe Opera and in the Santa Fe Jazz and International Music Festival at the Lensic Theatre. She has performed with many artists including Elena Andujar, El Pripi, La Tibu, Carmen Rasarao, Chuscales, YiYi, Silverio Heredia, Tequila de Jerez, Omayra Amaya, Jose Cortes, Manuel Gutierrez, Kina Mendez, Juan Siddi and Keiko Isshiki. She choreographed and performed in many productions including “Flamenco Masters” (Denver, CO 2015), “Houston Spanish & Flamenco Festival 2015” (Houston, TX 2015), “Flamenco X3”(2015), “Gypsy Passion”(2014), “Flamenco Fiesta!” (2014 & 2013), “Forever in My Heart” (Santa Fe, 2013 ), “My Gypsy Soul” (Santa Fe, 2012), “Chuscales at Old Main, Boulder” (CO, 2011), “Chuscales y Mina Fajardo con Las Tres Mujeres” (Las Vegas. NM, 2010), “Chuscales Live at MIT” (Boston, 2009), Telluride Jazz Festival (Telluride, 2008), “Chuscales at Tubac” (Tubac, AZ, 2007), “Soul del Arte Tradiciones e Innovaciones” (San Francisco, 2005), “Ainadamar, Landscapes and Impression” Santa Fe Opera (2005), “A Night of Flamenco Magic” Lakewood Cultural Center (Denver, CO, 2005), “Santa Fe Jazz and International Music Festival” (2004 & 2001), The John E. Morlow Guitar Series “ Flamenco Night” (Chevy Chase, MD, 2004), SJC Multicultural Arts Series “Flamenco” (San Juan Capistrano, CA, 2003). She currently teaches flamenco dance classes at Santa Fe Community College, Northern New Mexico University, Santa Fe Danceworks & Moving Arts Española and performs with Chuscales, Juan Siddi & Kina Mendez at Local Tablao & Theater in Santa Fe, NM. Fernando Barros Lirola was born in Motril (Granada) Spain in 1952 and focused his studies on geology at the University of Granada. Since 1980 he has performed in concerts and at Andalusian flamenco festivals around the world. He is a singer (cantaor), composer, writer and innovator specializing in flamenco music, with emphasis on bringing voice to the poets and writers of Spain, notably Federico Garcia Lorca, Antonio Machado, Juan Ramon Jimenez, Miguel Hernandez and Miguel de Cervantes. Additionally, he specializes in interpreting the texts of several anonymous medieval poets. Fernando is the author, with Sandra González, of the theatrical text, “Que venga, que venga flamenco!” His book, “Flamenco en las Aulas”, will be used in a college course on flamenco in the fall of 2015. He is writing a second book, “Why Flamenco?” Both books will be available in Spanish and English, and his contributions to various periodicals is extensive. As an invited member of the International Dance Council of UNESCO, Fernando is an active participant in the preservation of dance around the world. He attended the First International Congress of the Andalusian Institute of Flamenco and was the Director of the first international meetings of Motril Flamenco (2013). At the initial meeting of International Meeting of Folk Music Analysis, he participated in “Experience in Teaching Flamenco”, as well as courses in “Flamenco in the Classroom.” He has a solid body of work available on social media sites. While in New Mexico as an artist in residence in 2014, Fernando led workshops at elementary and secondary schools in Santa Fe, conducted master classes in Denver and Boulder, CO, and at the University of New Mexico in the Department of Spanish and Portuguese. He performed in venues In Santa Fe, Taos, Albuquerque, and Boulder. Fernando is on the leading edge of integrating the tradition of flamenco with his unique understanding of its cadences and rhythms, as well as the “melody” inherent in the poetry of his countrymen. His innovations include use of the voice as an instrument of positive expression, in combining traditional melodies with harmonies unique to the flavors and textures of the verses, and in engaging the audience in the meaning of expressive emotions. Fernando’s work can be viewed on various social media sites. He is available to conduct classes, design curriculum, perform, and participate in panel discussions on the fascinating history of flamenco as it has evolved over the centuries. Alejandro Valle is a son of Chuscales and Mina Fajardo. He played the cajon for Prince Felipe and Princess Letizia of Spain at the Palace of the Governors, Santa Fe, NM in 2009. He acted for “Seal Team Six”. (TV, 2012). He played in many productions including “Flamenco x3″(2015), ” Gypsy Passion”(2014), “Forever in My Heart” (2013), “My Gypsy Soul at El Museo Cultural de Santa Fe”(2012), “Maria Benitez, Next Generation”(2011, 2010, 2009) “the celebration of city’s 400the anniversary at Fort Marcy, Santa Fe, NM” (2009), “Juan Siddi Flamenco Santa Fe at Lensic” (2015,2014, 2013, 2012, 2010, 2009). Additional performers include Janira Cordova, Michale Kott, Veronica Medina and Navidades Flamencas.